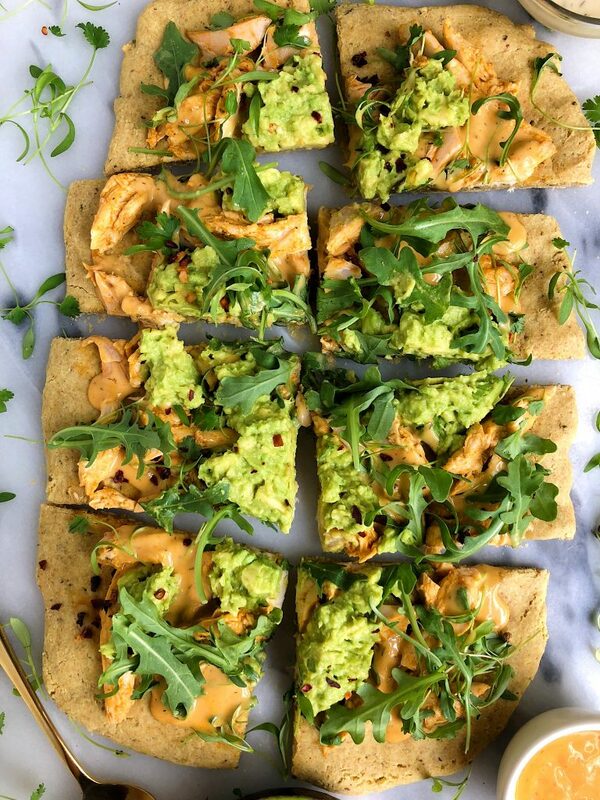 Paleo Guacamole Buffalo Chicken Pizza made with free-range organic chicken and a paleo pizza crust for a delicious gluten and dairy-free pizza recipe! Usually Jord isn’t for dinner on most nights. He typically works until later and eats at the office, so it is me dining solo at home. But on a recent weekday night, I knew he was going to be home for dinner so I wanted to make something I thought he’d love. 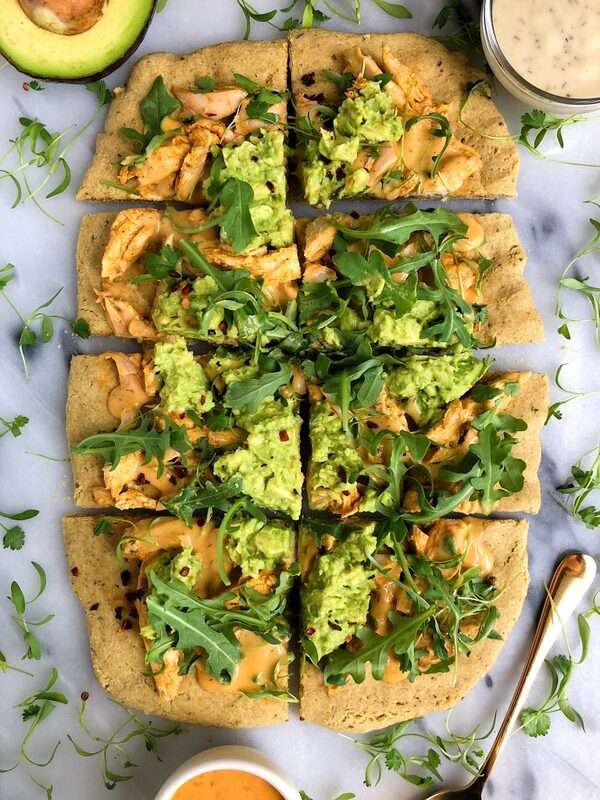 Insert – Buffalo Chicken Guacamole PIZZA! Heck to flipping YES friends. 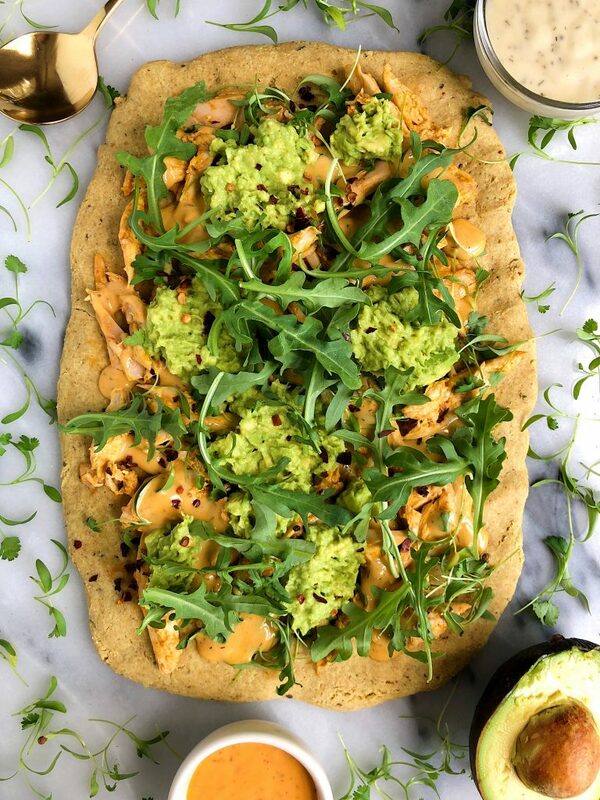 A paleo pizza topped with organic free range chicken, buffalo sauce and some dreamy guacamole? What isn’t there to love. When J walked in the door he immediately asked what was for dinner (the usual first question when he is home). I told him this Buffalo Chicken Guacamole Pizza, expecting him to break out into a happy dance and do cartwheels down the hallway. But no. He sounded grossed out and wasn’t really as into as I thought. I still served it for him anyways (haha!) and what do ya know? 2 minutes into his dinner and he is loving it. “Oh wow, Rach, this is actually good”. I like to call that – success. I know this combo sounds a bit crazy and out of the box but the flavors are on point, the fresh guacamole paired with a dreamy buffalo drenched chicken, is too good. Plus this is made with all organic and healthier ingredients, making it sound 100x more gluttonous than it is. You guys see that I pretty much only use Butcher Box meats in our home. Every month we stock up on meats from them like grass-fed/grass-finished beef and steaks, organic free-range whole chicken, breasts and thighs and our favorite – BACON. We have also ordered their grass-fed/grass-finished beef burgers and the sausage, both too die for. And too perfect for summer barbecues and get togethers. My Mom served their burgers for our family dinner last month and they were a hit. It is so important to me to eat meat that is high quality and that I can trust who I buy from. You read all about Butcher Box in those Buffalo Chicken Stuffed Sweet Potatoes and I am so excited by how many of you are now ordering and subscribing. Their meats are super affordable and comparable to those in the grocery store (even cheaper in some cases). They source from farms they can trust that take care of their animals. No added hormones ever. All grass-fed AND grass-finished. Spread a few scoops of it across the pizza, sprinkle the arugula then slice and enjoy! Thank you Butcher Box for sponsoring this post. It means so much to me to work with brands I love and believe in!